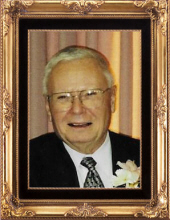 Scott Muir, 88 of Pemberville, Ohio passed away on Wednesday, March 27, 2019 at his home. He was born on June 15, 1930 to Winfield and Edith (Musser) Muir Sr., in Pemberville. He was a 1948 graduate of Pemberville High School and would later serve his country in the U.S. Army during the Korean War. Scott married Norma Ernsthausen on October 28, 1950 in New Rochester. Scott and Norma raised three children and celebrated over 64 years of marriage together before her passing in 2014. He worked as a plant manager for Modine Manufacturing 25 years, retiring in 1992. Scott’s memberships included; First United Presbyterian Church of Pemberville, having sung in the choir and served as an elder, and the Pemberville Freedom Twp. American Legion Post #183. He was a former trustee of Pemberville Library, served as a director at various financial institutions including the Citizens Savings Bank in Pemberville. He and Norma also taught ballroom dancing over 20 years at BGSU and at the legion in Pemberville. However, it was his family that always gave him the greatest joy. Scott is survived by his daughters: Sandra Muir of Upper Arlington, Theresa (Michael) Hubbard of Toledo, grandchildren: Kali (Jonathan) Gomez, Kurt Grossman, Kevin Grossman, Michelle (Gregory) Yarick, Ryan Miller, 6 great-grandchildren and special friend, Barb Forbes. In addition to his wife Norma, Scott was preceded in death by his parents, daughter: Cyndi Muir and sister, Paula Lembke. Family and friends will be received 4- 8 p.m., Sunday, March 31, 2019 at the Marsh & Marsteller Funeral Home, 4094 State Route 105, Pemberville, OH. A funeral service will be conducted 11 a.m., Monday, April 1, 2019 at First United Presbyterian Church, 106 Perry Street, Pemberville, where there will be an additional time of visitation from 10 a.m. until the time of service. Rev. Jim Miller will be officiating. Interment will be in the Pemberville Cemetery. There will be a bereavement luncheon served in the church fellowship hall immediately following the cemetery committal service. Memorials may take the form of contributions to: The Wounded Warriors Project or the First United Presbyterian Church. On-line condolences may be shared with the family at www.marshfuneralhomes.com. To send flowers or a remembrance gift to the family of Scott Muir, please visit our Tribute Store. Officiating will be Rev. Jim Miller. A bereavement luncheon will be served in the church fellowship hall following the cemetery committal service. "Email Address" would like to share the life celebration of Scott Muir. Click on the "link" to go to share a favorite memory or leave a condolence message for the family.